How to Book a Hiking or Biking Tour Through the Banaue Rice Terraces -- And 5 Reasons Why You Should Do It! The Philippines has a number of mountains and volcanoes that tourists love to hike or bike. But in Ifugao, 10 hours away from Manila, they leveled up the game! 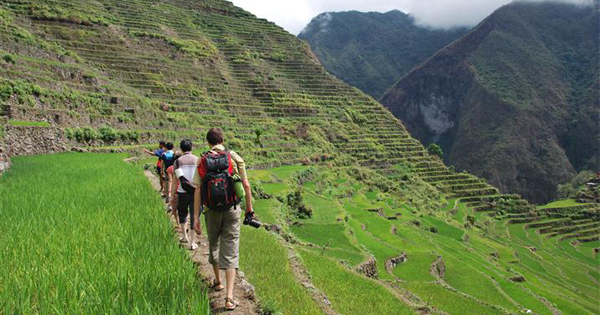 Banaue Rice Terraces, ancient terraces carved into the mountains of Ifugao about 2,000 years ago, are not just a sight to see but it is also great for hiking and biking. #1 - One-of-a-kind Adventure: Contrary to what many people might think, the rice terraces is a challenging hike. It is actually more difficult to climb than mountains due to the steep terrain, sharp rocks, and narrow sections. What more when biking! Definitely a must try for adventure-seekers! #2 - Breathtaking views: Feast your eyes on the spectacular landscape of the terraces that nothing could ever compare to. The journey to the top viewpoint would be greatly rewarded with the amazing view of one of the wonders of the world. #3 - Traditional Ifugao Hut: Sleep like a local, live like a local. Most accommodations in the area are native Ifugao huts perfect for cultural immersion. Whatever exhaustion from the hiking or biking would be gone once you rest in one of these traditional abodes. #4 - Lovely people: Experience a remarkable journey from terrace to terrace while meeting and greeting the very welcoming natives of Ifugao also known as the Igorots. Always ready with a smile and warm greetings, they would make you forget any tiredness. #5 - One with nature: Leave behind the hustle and bustle of the metro and disconnect from the rest of the world in this untroubled getaway. Power is a hot commodity in this area, and there is barely any phone signal and internet. It's just you and nature.